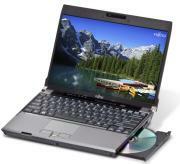 Craig over at GearBits has put together a video review of the Fujitsu LifeBook P8010. The P8010 is one of Fujitsu’s ultraportable lineup, weighing in at under 2.9 pounds. It’s 12.1″ display is an LED-backlit display which reduces the size, weight, and power consumption. Helping keep the weigh down, the P8010 is powered by an Intel Core 2 Duo SL7100 running at 1.2GHz, which reduces the need for cooling as well as extending the battery life. You need to watch Craig’s review to get a good idea of the size – even with a 12″ display, it’s still incredibly compact. This entry was posted in Fujitsu, Reviews, Reviews - Video. Bookmark the permalink.